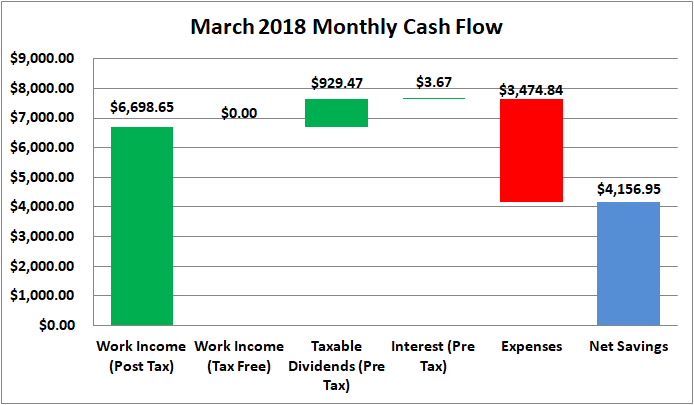 March saw a dip on the income side of the equation; however, I can't complain too much about how it ended up. For the month total income amounted to $7,631.79. Unfortunately expenses were still rather high at $3,474.84. That's puts the net savings for March at $4,156.95 which works out to a savings rate of 54%. Based on work income alone the savings rate was still a hefty 48%. A few notes about the budget check. All income is only income that I receive and does not include my wife's income likewise for the expenses. We've found it's easiest for us to just keep separate accounts since I'm gone most of the time for work. Also, pre-tax withholding for the 401k (I currently withhold 6% in order to get the full 5% employer match) and the ESPP through my employer (8% post tax withholding) are not included in the above savings amount. Truly passive income, dividends and interest, totaled $933.14 during March which was about a $23 increase from December 2017. *Dividends are from my taxable accounts only. Based on March's spending the passive income for March covered 27% of expenses. Thus far in 2018 I've totaled $1,496.94 from income outside of a traditional day job. Despite having a solid nominal amount we decided to hold off on aggressive debt reduction until our taxes were filed just in case we owed money. Well that's done now and we're getting a pretty sizable refund. So debt reduction should be headed our way soon. There's still around $24k of debt, namely my wife's car and our air conditioner that needed to be replaced last year. The plan going forward is likely going to consist of taking half of the net savings each month and keep that as cash and use the other half to pay down our debt. If all goes well I think we'll have a pretty good shot at getting rid of the non-mortgage debt sometime in Q3. Getting rid of the two main debts alone will free up around $850 of cash flow each month which will be a huge boost to our savings and in turn our ability to invest for the future. I didn't make any real progress on reducing expenses during the month...shame on me. Although much of that has to do with the fact that I've just been working way too much and the little bit of time I've had at home has been taken up by the honey-do list. Some low hanging fruit for reducing expenses is our homeowners and car insurance. Those two combine for over $500 per month and with just a little preliminary price checking it looks like we can save anywhere from 10-40% while having even more coverage than we currently do. How is your monthly cash flow situation? What are you doing to increase your savings? Focusing on increasing income or reducing your expenses? It seems like your in a really good place. 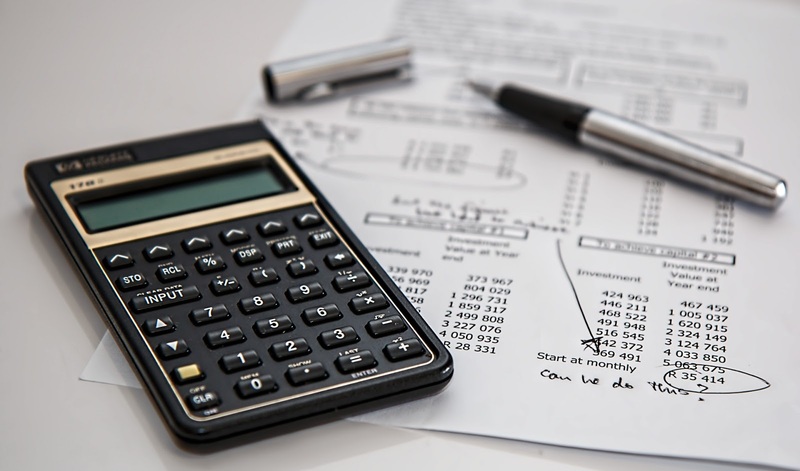 You are tracking your expenses and income and adjusting your strategy accordingly. Once that debt load in eliminated it will be like opening the flood gates into your investing account. Good article PIP. Thanks for sharing.